SpaceX has had a very good first test of its Falcon Heavy rocket, the heavy-lift orbital vehicle that can carry twice the weight of its closest competition in active operation. The massive, three-booster rocket took off from Cape Canaveral in Florida as planned on Tuesday at 1:30 PM EST, lifting off from Kennedy Space Center’s LC-39A. This is a historic moment for SpaceX, since it has been aiming to build and launch the large capacity rocket since 2011. Initially, the planned schedule had targeted 2013 as a launch window, but various delays and setbacks pushed down its inaugural flight – until today. Musk has previously described SpaceX’s early views on how hard it would be to build this rocket as “naive,” to account in part for the considerable departure from that early timetable. The rocket, which has 27 Merlin engines (as many as three Falcon 9s) has a low-Earth orbit payload capacity of up to 140,700 lbs, or it can carry 58,900 lbs to geostationary transfer orbit (GTO), or 37,000 lbs to Mars. Those numbers are all important because SpaceX is planning Falcon Heavy as a key linchpin in its Mars plan, setting the stage for a system that can ferry goods and people between Earth and the red planet. SpaceX’s payload for this mission includes a red Roadster destined for an Earth-Mars orbit, with a dummy on board wearing SpaceX’s new crew suit for its first astronaut missions, and a data storage device with Isaac Asimov’s classic space trilogy loaded up. There’s also a plaque inscribed with all SpaceX employee names, so they can tag along on the payload’s billion+ year journey. The Kennedy launch complex used for this mission, which SpaceX has leased from NASA, is as historic as its latest resident – it was previously used for both the Apollo program and the Space Shuttle before being taken over and reconfigured for Falcon Heavy by SpaceX. SpaceX also attempted a recovery of all three of the first stage boosters it used during the launch. It has recovered two of those thus far, and we’re waiting to hear back from SpaceX on the official status of the final, third booster, which was landing at sea. So what now? From here, the rocket’s payload (read: the aforementioned Tesla, pictured below as the nosecone seperates) will pass through the Van Allen belt — a zone of charged particles and extreme radiation surrounding Earth. Assuming it makes it through that radioactive beatdown, it’ll head for a heliocentric orbit between Earth and Mars, from which point it’ll spend the next few hundred million years whizzing through space. Update as of 1:50 PM Pacific: Here’s the current view of Earth as seen by the in-car astronaut dummy (“Starman”, as he’s known around SpaceX) and beamed back to us via this livestream. 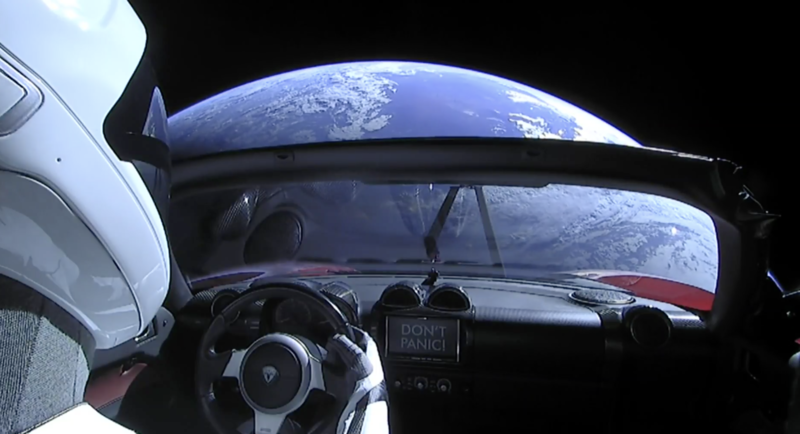 Note the “Don’t Panic” on the dash display, a nod to Douglas Adams’ Hitchhiker’s Guide to the Galaxy; there’s also, according to Elon, a towel in the glove box.